THREE OVAL 4.5mm x 3mm (0.18" x 0.12") & TWO 2.5mm (0.10") VIBRANT RED RUBIES & FIERY OPALS, ALL SET IN THIS RARE AND COMFORTABLE SOLID STERLING SILVER ETERNITY SETTING.If you are looking for an Eternity ring which is High Quality but is different and unusual, not seen every day, then look no further.This ring is simple and gorgeous, the pictures really do not do this ring the justice it deserves. The ring has a good thick shank to it which indicates a quality design and is good for comfort and durability. 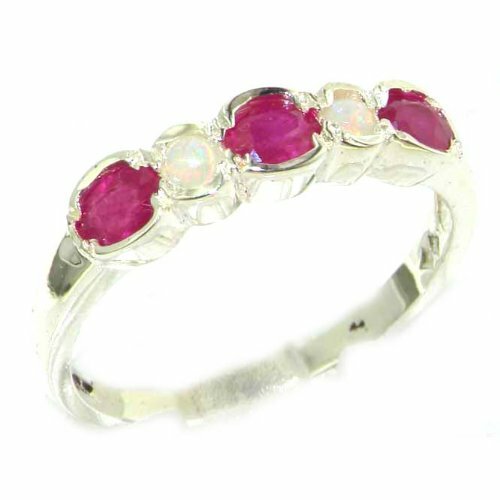 All the Rubies & Opals are Genuine & Natural, mined from the ground.Inside the shank of the ring you will find a Full British Silver Hallmark which was made by the Assay Office in London. This includes the symbols 925, the Leopards Head and the Royal Lion.